We invite the public to a pre-release sale of a selection of our 2017 reds and 2018 whites. Limited quantities of the wines will be available for pre-sale at a DISCOUNT throughout the weekend of February 24th & 25th. If you live in New Jersey, Pennsylvania, or Florida, we are offering the option to SHIP them direct to you before the official release date. If you live outside those areas or if you prefer to visit our tasting room, we are offering a PICK UP option as well. We invite our Wine Club members & Special Guests to the Hawk Haven tasting room for an exclusive barrel tasting & pre-release sale of a selection of our 2017 reds and 2018 whites. 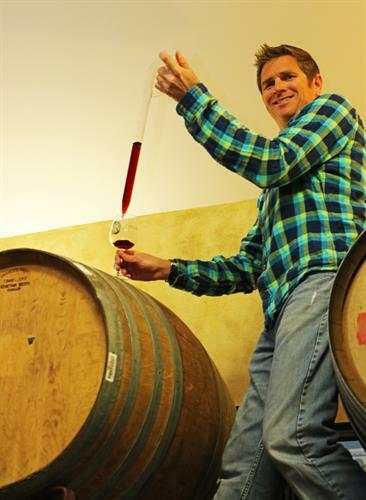 Winemaker Todd Wuerker along with his winemaking staff will be using an instrument called a “wine thief” to offer samples of wine straight from the barrels where they are aging. Learn about the winemaking style of the Hawk Haven Vineyard dream team as they walk you through their process and labor of love. Email info@hawkhavenvineyard.com to RSVP. Wine Club Members are encouraged to bring friends. All of the wines tasted will be available for pre-sale throughout the weekend. If you live in New Jersey, Pennsylvania, or Florida, we are offering the option to SHIP them direct to you before the official release date. If you live outside those areas or if you prefer to visit our tasting room, we are offering a PICK UP option as well. If you are not a Wine Club member, you can become one by making a qualified purchase from our tasting room. More info at www.hawkhavenvineyard.com/shop/wine-club-membership.